Send automated bulked mailings to customers, business partners or friends. VmbMailwill process a recipient list which contains the mail address, message, sending state and attachment if designated. The format of this file is CSV which is compatible to numerous database applications and MS Excel. So it is possible e.g. to export the required customer data from a database as CSV file and use it in Automail. You can define specific content or attachment files for every recipient. Use the $Name variable in message text to replace it automatically by the recipient name while a mailing is running.Use a personalized message text as well as a personalized attachments for every recipent. 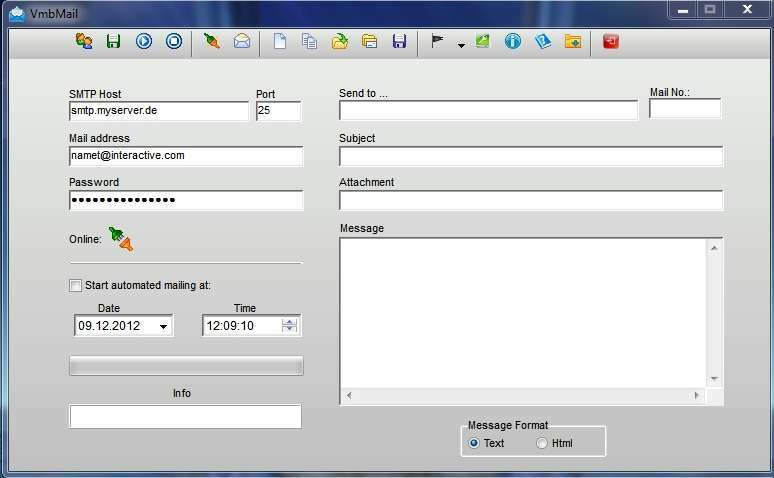 This site does not contain serial number, crack, keygen VmbMail serial number : serial number is the simplest type of crack. A serial number(cdkey,product key,etc) is register the program as you may already know. a crack or keygen may contain harmful software. If you cannot find the exact version you want, just give it a try. for more information read .nfo/.txt/.diz file include in zipped file.